The original hellhound and anti-theft security system — the ur-text of canine lore, if you will — is Cerberus, the three-headed dog of Greek mythology. Cerberus may trace his origins to the ancient world, but unlike the devil dogs we see in schlocky horror films, never in any of these stories is the monstrous canid ever characterized as evil or dastardly. In fact, Cerberus is a working dog; his task, to guard the gates of the underworld. Even if Hades later became associated with Hell, in the classical world, there were no such distinctions made regarding the afterlife. Everyone, good or bad, hero or enemy, found their shades in Hades after death, and Cerberus was there to make sure they stayed put! Let’s look into the Cerberus legends and their long legacy! The simplest and most consistent description of Cerberus (also transliterated as “Kerberos”) is the guard dog of the underworld. One wonderful facet of ancient mythological traditions is their inconsistencies. Depending on the ancient source material — be it Hesiod’s Theogony, Apollodorus’s The Library, or any of the later classical and early modern works that drew upon them — this titanic canine had as few as three, as many as 50, even up to 100 heads. Apollodorus gives a typical physical description of Cerberus, noting that he “had three heads of dogs, the tail of a dragon, and on his back the heads of all sorts of snakes.” The dogs’ multiple heads are standard; features that vary by author include the feet, tail, and coat. 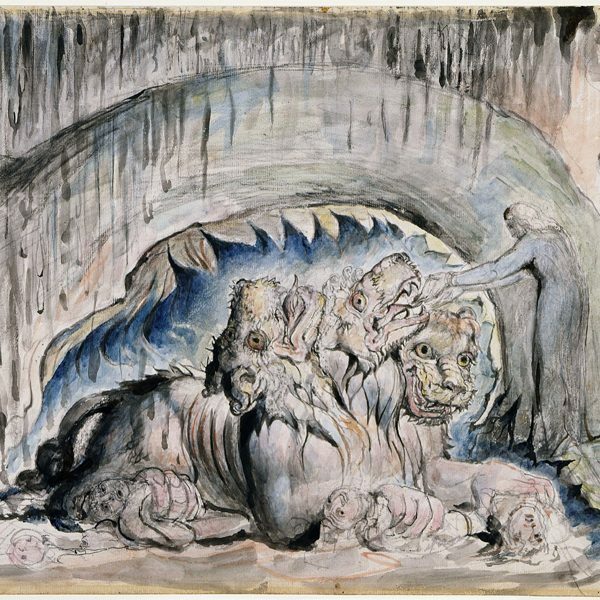 Certain artistic and literary traditions depict Cerberus with a lion’s feet. In Ovid’s Metamorphoses, even the dog’s drool was full of “foul poisonous liquids,” and his gaze, like that of the gorgon Medusa, could turn a living person to stone. What is the origin of Cerberus? The family of Cerberus predates the major pantheon of Greek gods and goddesses themselves. Most legends agree that the guard dog of Hades was one of the monstrous offspring of Typhon and Echidna. Descriptions of these primordial beings may offer insight into the bizarre hybrid nature of their children. Like his canine son, Typhon had multiple heads; anywhere between 50 and 100 sprang from his neck, and even more from his hands. Echidna, Cerberus’s mother, had the torso and head of a beautiful woman, and a trunk consisting of a tremendous serpent. This lovely couple produced some of the most fearsome monsters in all of ancient mythology. Among their children, we can count the Hydra, the terrible serpent who, when one of its heads was cut off, two grew in its place. The Sphinx — with the body of a lion and the head of a woman, whose stone-faced visage can be seen near the pyramids of Egypt to this day — was another, as was the Nemean Lion, a beast with an impenetrable hide. The Chimera was another; like its parents, a composite monster, with the head of a lion, a goat’s head braying from its midsection, and a tail that was a living snake. It may seem like a bit of a strange question, but the answers in mythology are not entirely satisfying. 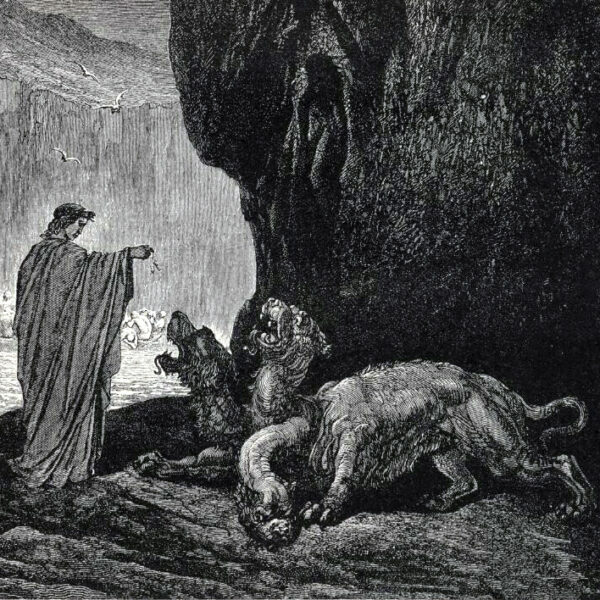 For instance, in Theogony, Hesiod claims that Cerberus, “the brazen-voiced hound of Hades … eats raw flesh.” As we’ll see in a moment, very few mortal beings ever attempted to enter the underworld without divine assistance. Since Cerberus kept perpetual watch at the gates, preventing the living from entering and the dead from leaving, he probably didn’t have much occasion to hunt. If we believe Ovid’s assertion that a look from the dog could calcify living flesh, the dog must have been perpetually hangry! One assumes that Hades, or one of his factotums had locally sourced raw flesh delivered, or that they had some kind of high-quality dog food shipped in. Although he was nominally a “hellhound,” Cerberus was not evil; he was a working dog. His job, once he was gifted to Hades, the god of the ancient Greek underworld, was to prevent any living being from entering the realm of the dead, and to keep the dead from escaping. Despite being one of mythology’s iconic guard dogs, most of the best-known stories involving him have to do with the people who managed to elude, confound, or defeat his efforts. Orpheus, a mortal, and the most gifted musician and poet of ancient legend, used his skills to charm his way past Cerberus and enter the land of the dead. Upon the accidental death of his wife, Eurydice, Orpheus was counseled to enter Hades and attempt a rescue. His music upon the lyre was said to be so sweet and so moving that it could wring tears from rocks. It was enough to sedate the vigilant Cerberus, stationed at the gates of the underworld. The best-known story that includes Cerberus is his humiliation at the hands of Hercules. Hera, the wife of Zeus, drove Hercules insane, and during this fit, Hercules slew his own wife and children. This event, and the penance for it, instigated Hercules’s most legendary journeys, to wit, the 12 labors. In the course of these adventures, Hercules had to defeat no less than three of Cerberus’s siblings. He had to slay and skin the Nemean Lion, whose hide was impervious to every blade. 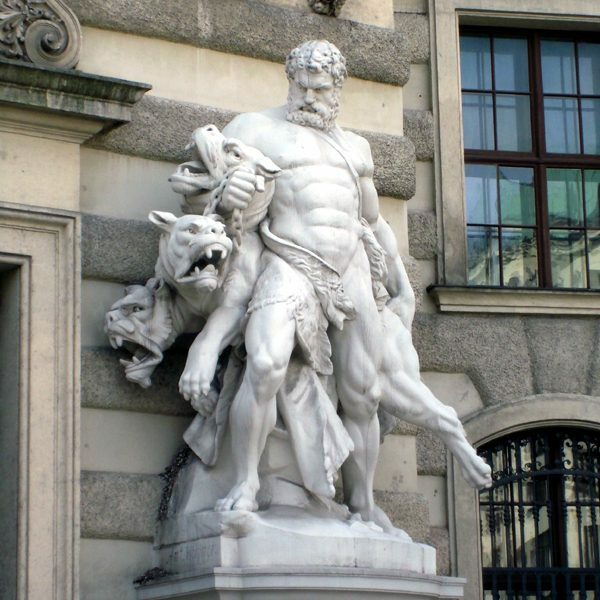 Hercules also slew the multi-headed Hydra, followed later by Orthrus, a two-headed dog. In most iterations of the labors of Hercules, the final task is to subdue and retrieve Cerberus. The only catch was that the dog had to be brought to King Eurystheus alive and unharmed, and Hercules could use no weapons. Wearing only a breastplate and the Nemean Lion’s skin for armor, the hero made his way to Hades, where he wrestled the three-headed dog into submission and accomplished his mission. Roman mythology co-opted most of the primary figures of their Greek neighbors. In Virgil’s Aeneid, the hero Aeneas, like Orpheus and Hercules, had to descend into the underworld. 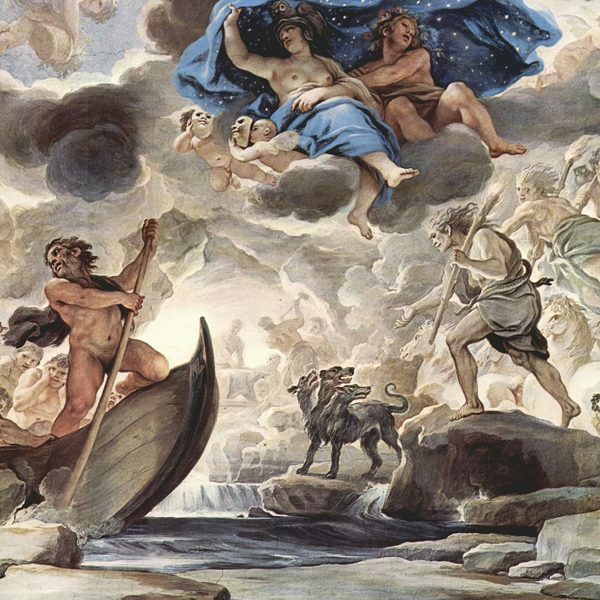 Like his predecessors, Aeneas needed counsel and assistance to get past Cerberus. Where Orpheus charmed the three-headed monster with music and Hercules subdued the beast through brute strength, Aeneas went in with the Cumean Sibyl who brought along a soporific dog treat for the occasion. Cerberus ate the little cake, and promptly fell asleep, allowing them to pass unaccosted. Despite having relatively few narratives that revolve around him, Cerberus cast a long shadow in literature, culture, and art. Paintings and statues of Cerberus that show mythological scenes never really went out of fashion, from the ancient world to the modern. The guard dog of Hades also has a rich literary heritage, and has a number of direct literary offspring. From Sir Arthur Conan Doyle’s famous Hound of the Baskervilles (1901) to Stephen King’s rabid St. Bernard, Cujo (1981), the image of the hellhound became a familiar one in popular literature and culture during the 20th century. Doubtless, Cerberus’s best-known contemporary analogue is Fluffy, Hagrid’s three-headed pet in J.K. Rowling’s first Harry Potter novel (1997). What is your favorite fictional or artistic version of the Cerberus legacy? The post Meet Cerberus, the Hellhound of Greek Mythology appeared first on Dogster.